At Reflex we care about the community. We support social upliftment initiatives like skills development and job creation, small business development, apprenticeship training etc. 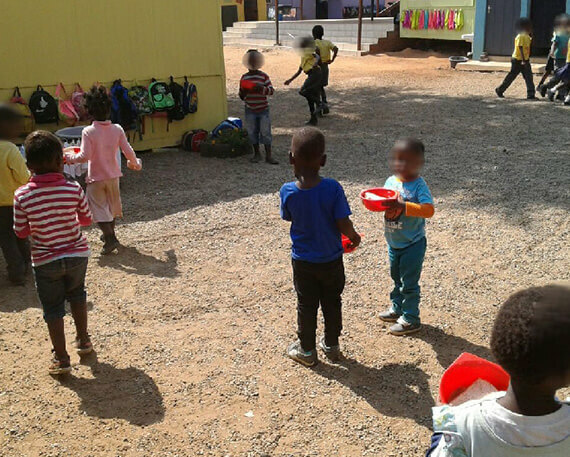 Reflex Panelbeaters and Spraypainters is a proud sponsor of New Beginnings Foundation, a social upliftment initiative aimed at rebuilding people’s lives and enabling them to become self-sufficient contributing citizens. 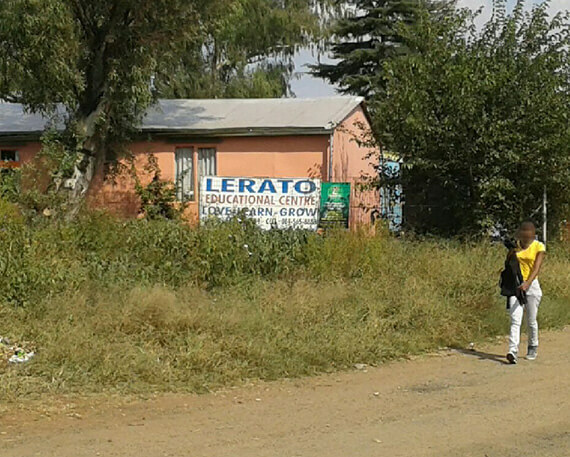 Lerato Educational Centre, clothes, feeds and most importantly, educates 460 disadvantaged children. 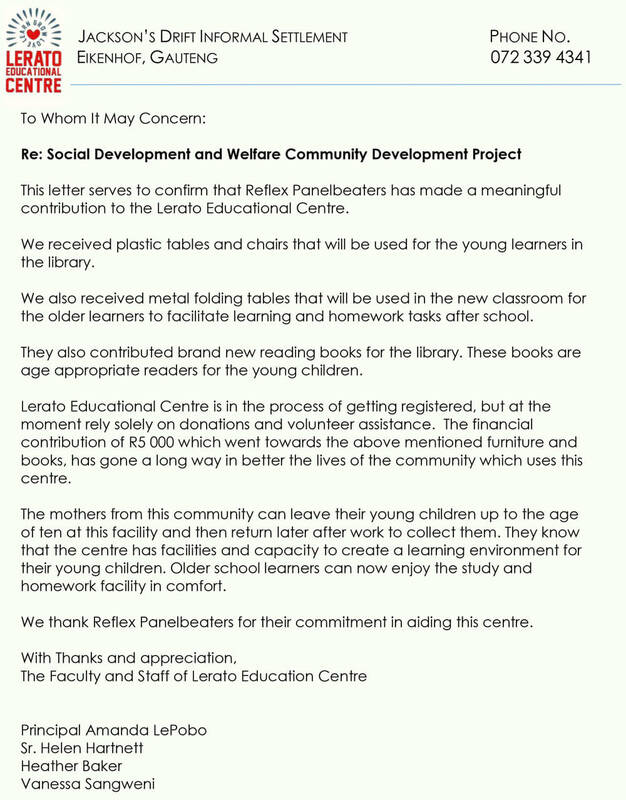 Lerato Educational Centre is not government funded and therefore relies on donations. 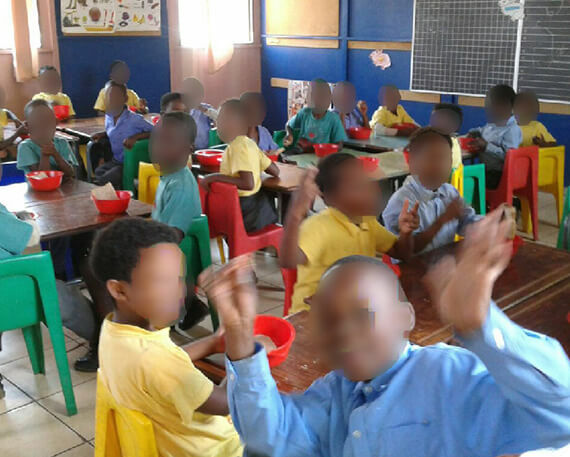 Reflex Panelbeaters and Spraypainters is honoured to assist the centre to facilitate the education of our South African youth. 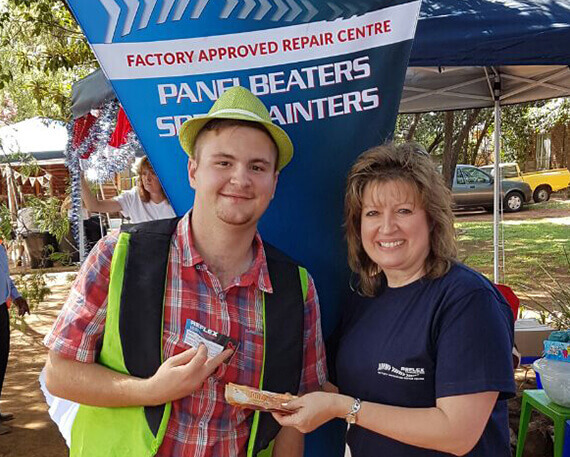 Reflex Panelbeaters and Spraypainters hosted a stall at the Entrepreneurs Christmas Market in Alberton on 10 December 2016. 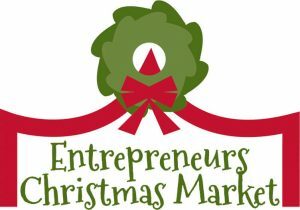 The market was in support of the community and was funded with donations provided by stall holders at Alberton Baptiste Kerk. These will go towards the refurbishment of the property to enable it to host future similar events for the community. A Raffle was offered by Reflex Panelbeaters and Spraypainters, with prize money of R1,000.00 being won by Mr Andre le Roux. We launched our internal learnership programme in March 2010, bringing on board more than 20 learners — representing 15% of our employees at that time. We absorbed these young people into our workforce and imparted work skills to them. 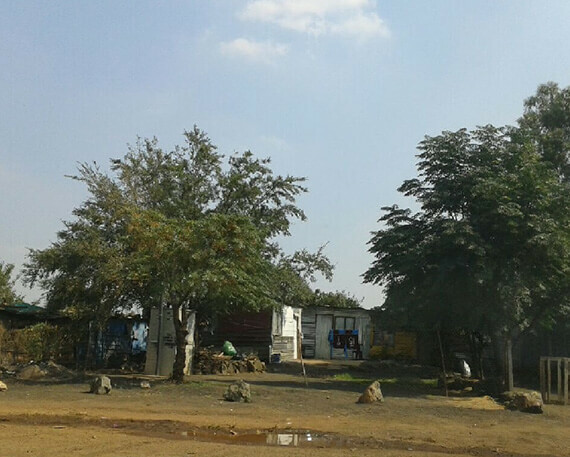 When this programme ended in February 2013, we appointed 80% of the learners to full time positions. 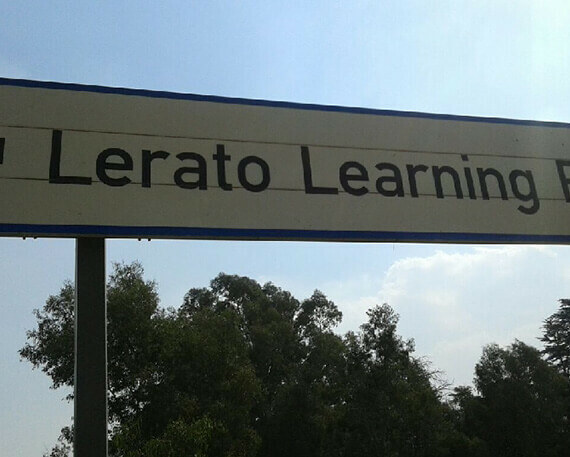 These learners, meanwhile, continued to advance their skills to this day. Since the inception of this initiative, we successfully qualified a further 4 artisans. Currently 3 more learners have entered into this initiative and we expect their completion to be at the end of 2019. We are accredited by the MERSETA to train apprentices in artisan positions like panelbeaters, spraypainters and mechanics, according to the Competency Based Modular Training programmes. We strive to have the best qualified staff working on accident-damaged vehicles. We are proud to be a part of and support small business enterprise development. Simon from SMG Auto Glass, benefits from our involvement with this venture. He owns a small business and we have been using his services and expertise for a number of years. Another two beneficiaries are Joe, from Motor Cool Airconditioners and Prince from Yarona Electronics. They too benefit from our support of their micro businesses. We regularly send employees on refresher courses presented by Manufacturers of vehicles in South Africa, Part suppliers and Paint Manufacturers. Norman came to Reflex in September 2007 after an extended period of unemployment left him homeless and living at the New Beginnings Care Centre in Boksburg. Reflex found the need to contribute towards the community and with the assistance of New Beginnings, we gave Norman and others with similar backgrounds, the opportunity to gain employment at Reflex Panelbeaters. With the support of our staff and Norman’s enthusiasm, he soon worked his way from being a workshop cleaner to a Storeman Supervisor and is now one of our workshop quality controllers.